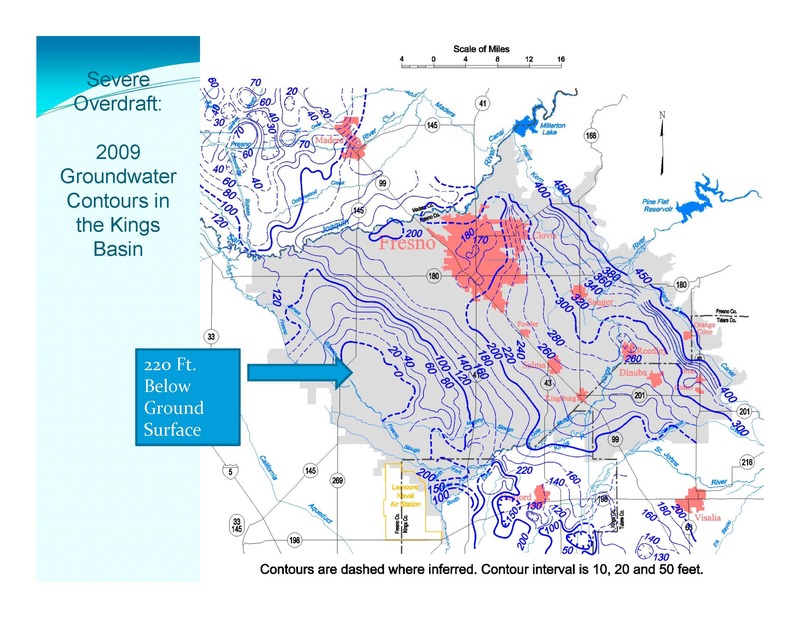 With the passage of the Sustainable Groundwater Management Act, many groundwater basins are looking towards groundwater recharge as a tool to help bring their basins into balance. 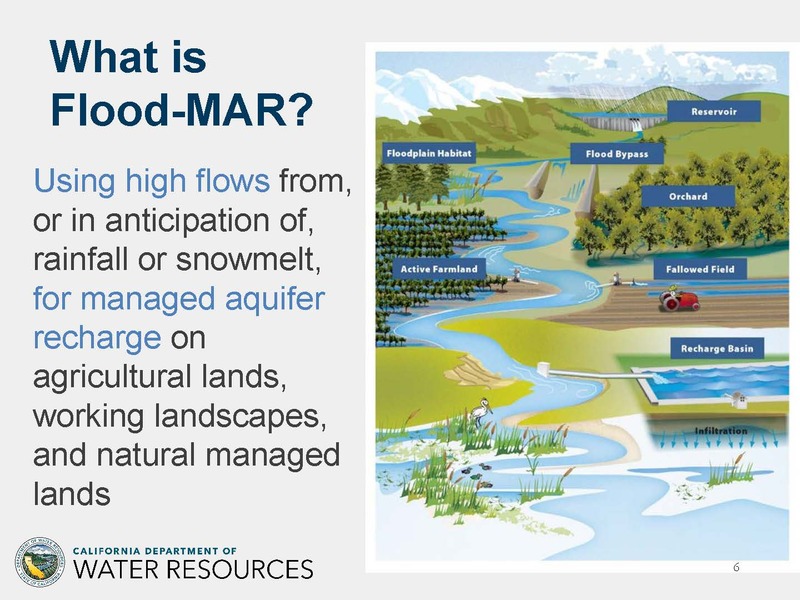 “Flood-MAR” is a resource management strategy that uses flood water for managed aquifer recharge (MAR) on agricultural lands, working landscapes, and managed natural landscapes. 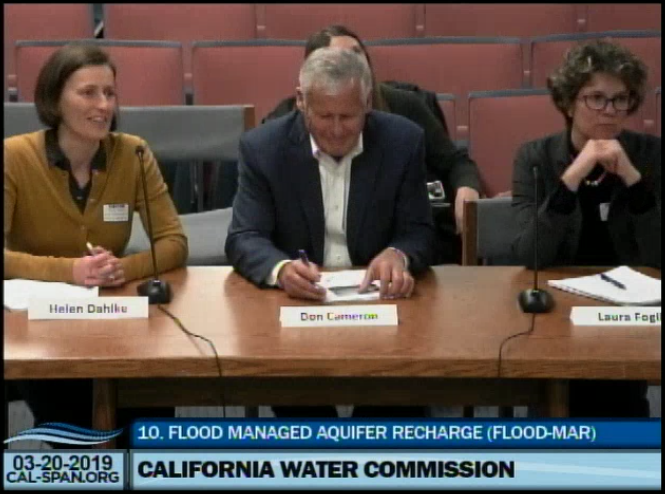 At the March meeting of the California Water Commission, a panel discussed Flood MAR with a focus on using agricultural lands for groundwater recharge. First, Kamyar Guivetchi from the Department of Water Resources discussed the Department’s efforts to advance the Flood MAR strategy; next, researcher Dr. Helen Dahlke discussed her research on crop suitability, soil suitability, and streamflow availability; then Don Cameron of Terra Nova Ranch discussed his experiences with on-farm groundwater recharge; and lastly, researcher Dr. Laura Foglia discussed a pilot project in the Cosumens River basin. 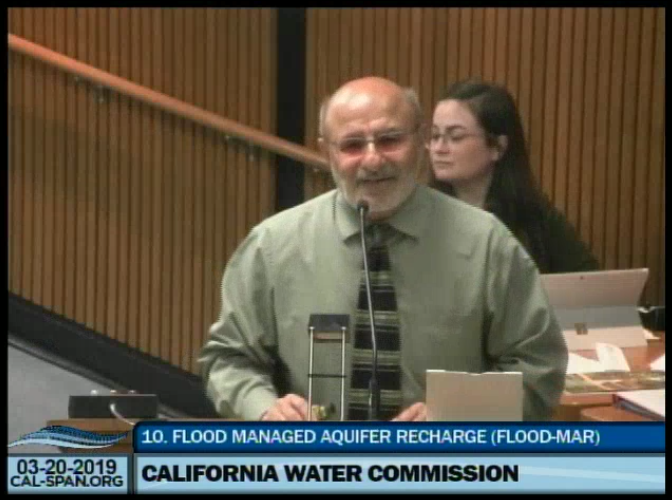 Kamyar Guivetchi is Manager of the Statewide Integrated Water Management Division for the Department of Water Resources. 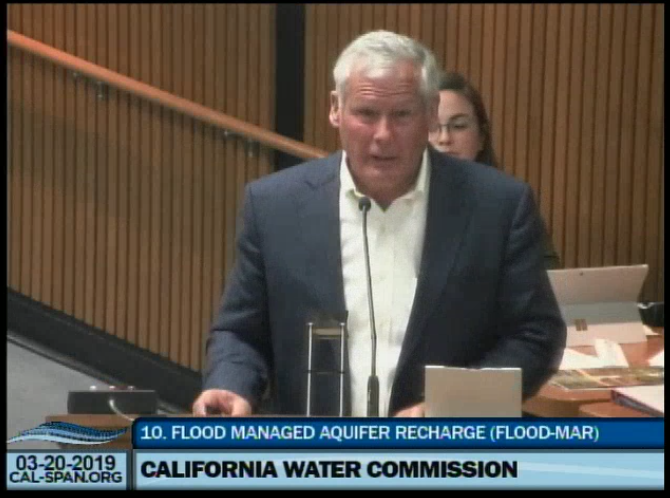 In his presentation, he discussed the efforts that the Department of Water Resources is doing to advance implementation of Flood Managed Aquifer Recharge, or Flood MAR. 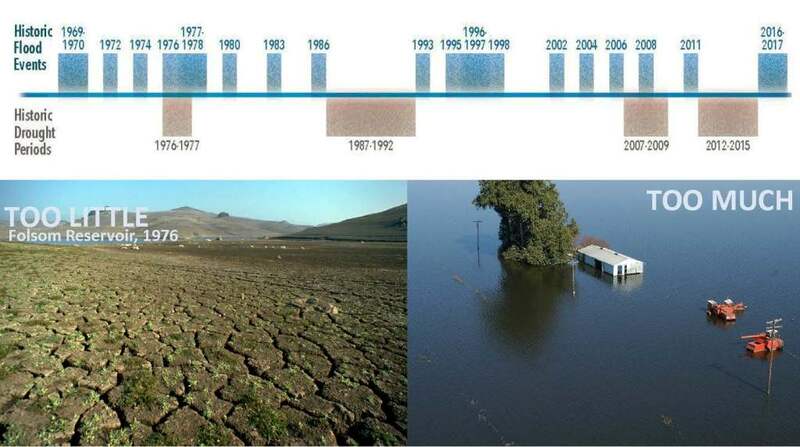 He began by noting that California water is a tale of extremes, and being a Mediterranean climate, that isn’t necessarily unusual, but climate change is making those extremes more pronounced, more frequent, and more consequential. The plot shows 120 years of simulated flows over the water year in the American River from 1981 to 2099; the first 20 years are presented as the historic data in the grayish tone and the last 20 years, 2070-2099 are presented in the amber color. There are some systemic and institutional challenges that are difficult to overcome, he said. 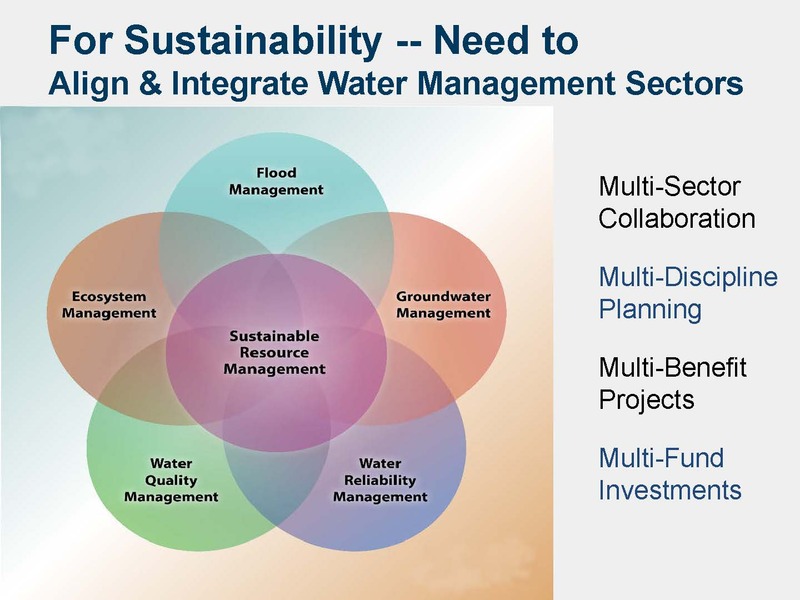 One is that the state is highly decentralized in the way we manage and make decisions about water, which in turn affects the way that regulations are set and implemented, often making it difficult to do multi-benefit projects in a timely and cost-effective way. There’s also a need for more information exchange amongst the water management sectors and it’s always a challenge to have stable and sufficient funding. Mr. Guivetchi said that they need to work on demonstrating a return on investment. “We can tell folks how much money we spent, what projects we’ve built and completed, but we’re not as good at showing how did that affect public health and safety, the environment, the economy, and those things that people really care about, recreation, cultural uses of water, and the like,” he said. He presented a diagram similar to a flower, noting that the petals are the main water sectors; historically and even today, we often work in the outer peripheries of these petals where there is little or no overlap, he said. However, to be sustainable, we have to consciously plan and implement and operate our projects towards the center where we get maximum overlap. 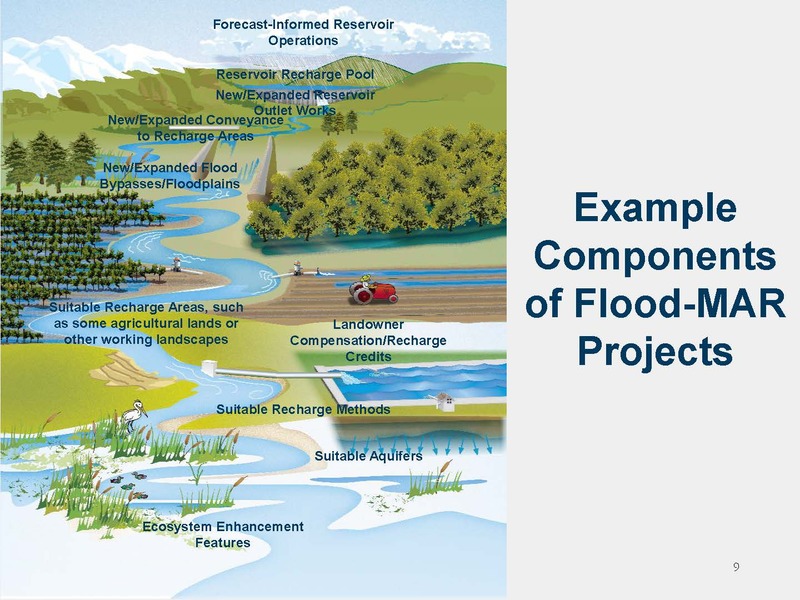 Flood Managed Aquifer Recharge (or Flood MAR) is a strategy to use high flows for groundwater recharge and doing it in a way that provides terrestrial ecosystem benefits as well as aquatic ecosystem benefits. The Corps of Engineers Hydrologic Engineering Center, back as early as 2002, published a report called Consumptive Use for Flood Protection, where they estimated about 1 MAF per year on average could be put into the ground just by reoperating the terminal reservoirs. To be successful, Flood MAR has to be a public-private partnership with voluntary participation and compensation for landowners in doing this. There are multiple ways to implement and scale up Flood MAR; it’s still an untapped management strategy, he said. 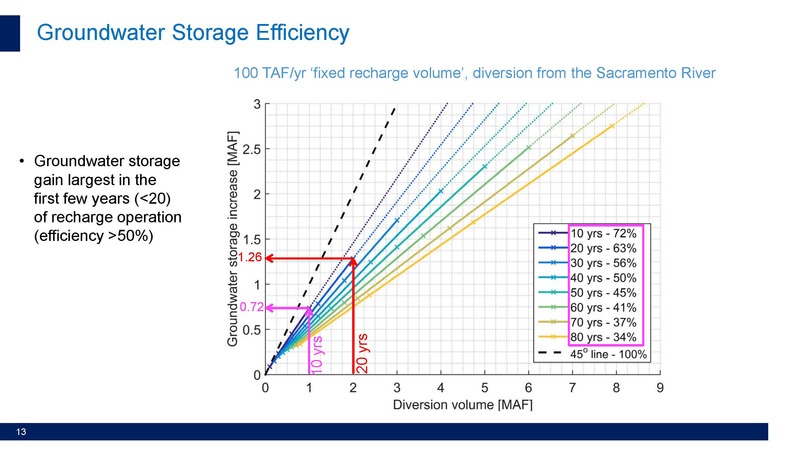 The graphic on the slide is from the Water Available for Recharge or WAFR report; the WAFR report only looked at the water potential shown in the light blue, but there’s still a lot of potential in those higher peak flows for using that to recharge depleted groundwater basins. Over the last several years, Mr. Guivetchi noted that the State of California has identified this strategy and supported its advancement. 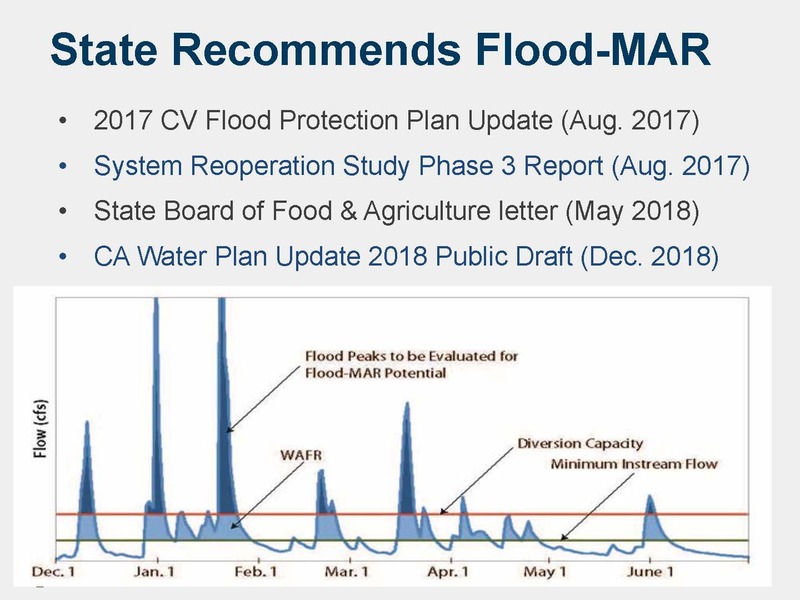 The Central Valley Flood Protection Plan doesn’t use the term Flood MAR but does talk about using flood flows for groundwater recharge as one of the portfolio of strategies for the Central Valley. 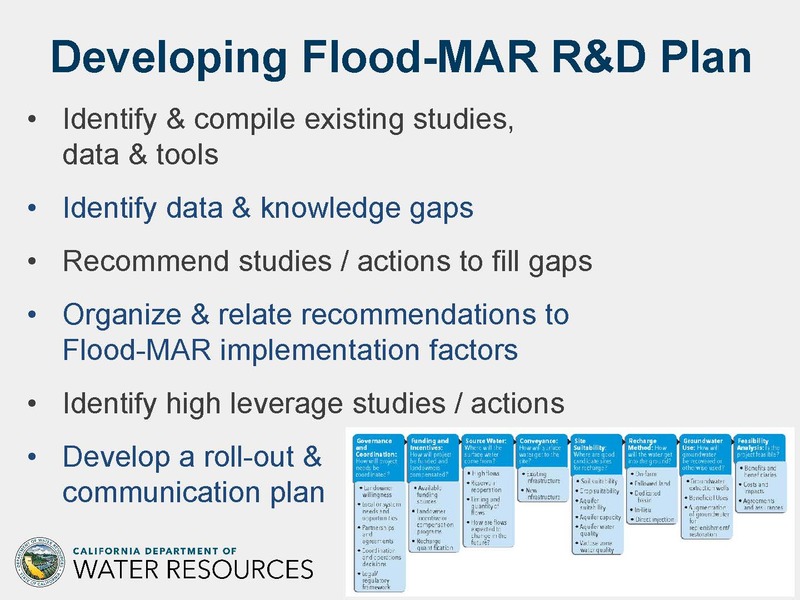 A lot of the work that DWR is doing on Flood MAR is part of the fourth phase of the System Reoperation Study. The State Board of Food and Ag and president Don Cameron sent a letter to Governor Brown with about a dozen or so recommendations for how the state could help to advance and scale up Flood MAR. The 2018 update of the Water Plan calls out Flood MAR as one of 19 key strategies for advancing California water. 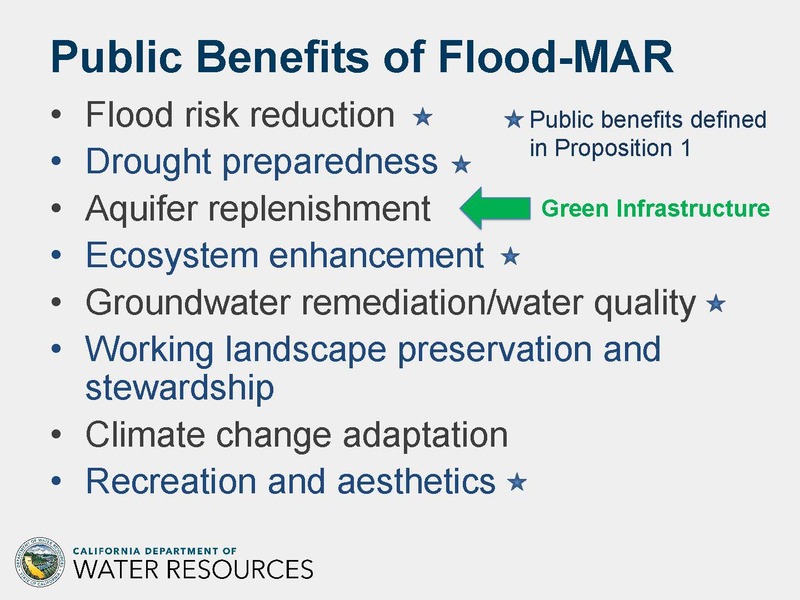 He presented a slide listing a number of benefits with Flood MAR. He noted that there are many public benefits that can be realized through Flood MAR, and the word public implies that the state could actually have an interest in helping cost share future Flood MAR projects. 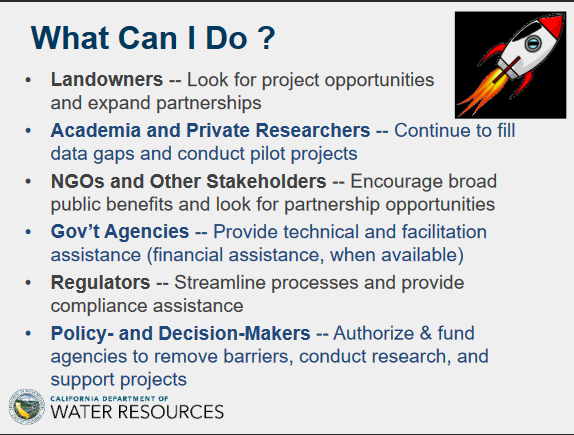 The benefits on slide with stars next to them are the benefits that were called out in the Water Storage Investment Program. 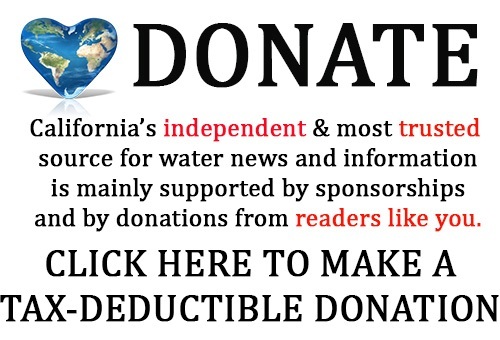 He pointed out that aquifer replenishment is conspicuously missing because the grant program was developed before SGMA and the emphasis on groundwater recharge, but now that the state has a responsibility for groundwater management, aquifer replenishment needs to be identified as a public benefit worth cost sharing. 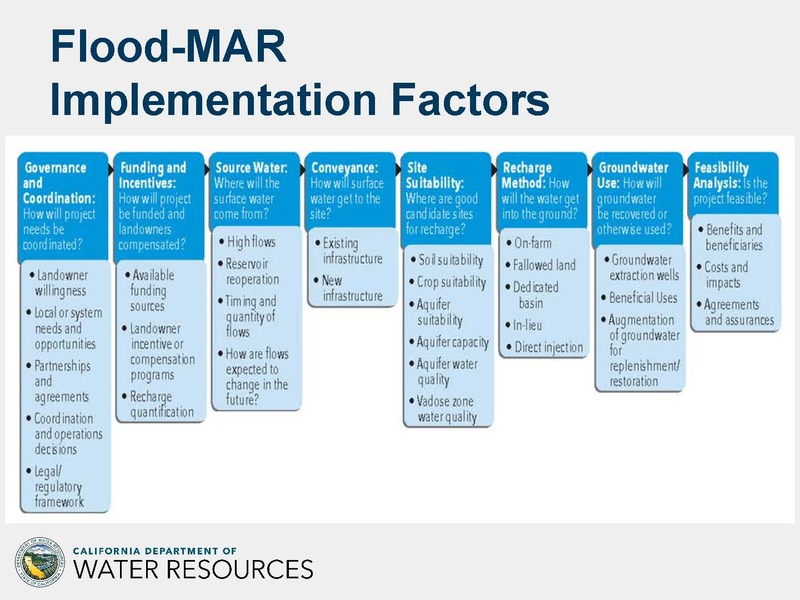 DWR has developed a white paper that identifies eight implementation factors with additional considerations under each of those. As they developed the white paper, challenges to implementation were noted and are described in the white paper under the various categories of governance and legal considerations that includes water rights, regulations, and permitting policy considerations. DWR has also put together a fact sheet and a draft Research and Development Framework. DWR has been working on two studies. One is the Merced River Basin Conceptual Study with the Merced Irrigation District, working through all 8 of those implementation factors to see how the Merced River could implement Flood MAR and where the opportunities and the challenges are. 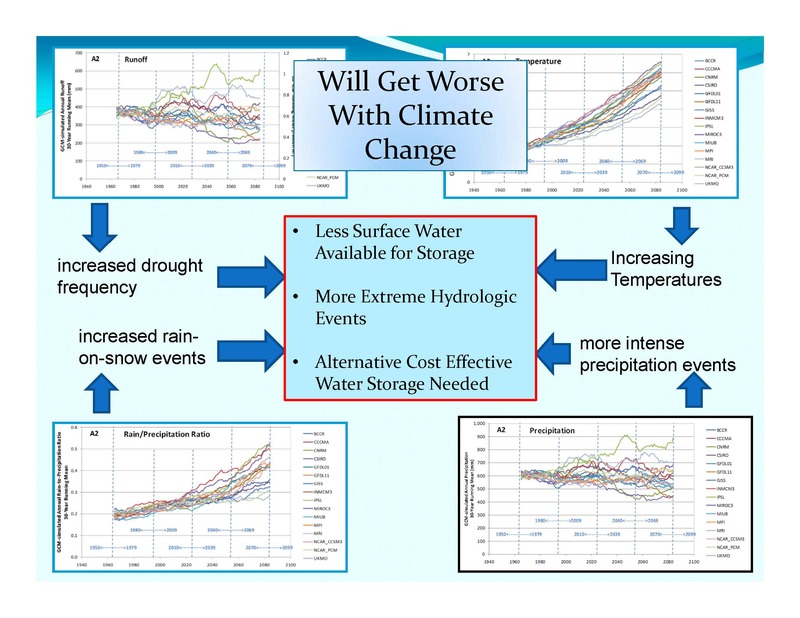 They are also working with the Corps of Engineers on the Tuolumne River Climate Vulnerability Study because that is really the input to all future Flood MAR studies. “I would advocate that the state of California should help partner and be part of doing climate vulnerability study in each and every major tributary throughout California because that’s the dataset that we’re going to need to plan to in the future,” he said. A research advisory committee has been convened to continue working on the draft Research and Development Plan which they hope to have out in draft form by the late summer or early fall. “What we want that to provide is a common call to action on where we should all invest to fill these data and information gaps needed to scale up Flood MAR,” Mr. Guivetchi said. Mr. Guivetchi said that the Department is looking for partners for future pilot studies and they are open to working with partners to develop strategies for overcoming the obstacles that have been identified in doing Flood MAR projects. Dr. Helen Dahlke is Associate Professor in Physical Hydrology at the Department of Land, Air and Water Resources at UC Davis. 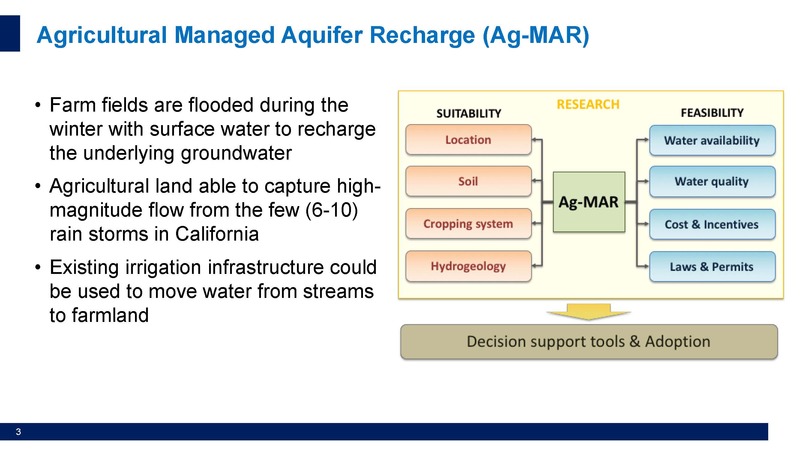 In her presentation, she discussed the research they are doing on using agricultural lands for groundwater recharge. 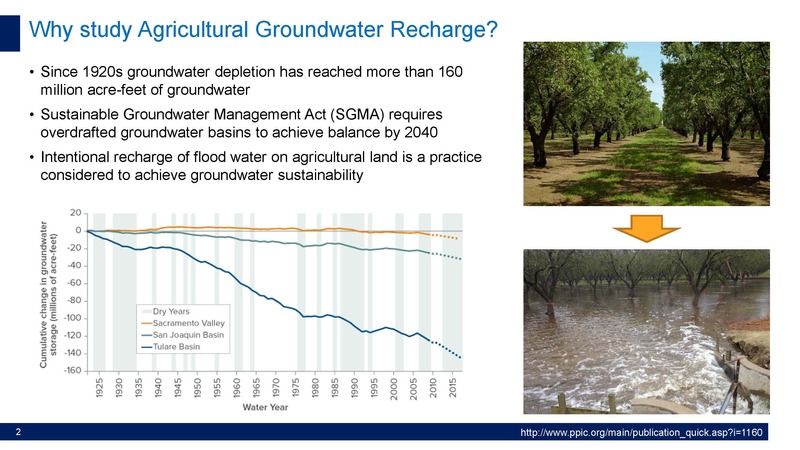 Due to the long-term overdraft of groundwater resources and the requirement of SGMA to manage groundwater basins sustainably, many water users are looking towards groundwater recharge as one mechanism to bring basins back into balance. During the winter months, the state can receive a lot of rain, often times in only a few atmospheric rivers that bring a lot of rain and result in a lot of runoff. The question is how to capture more of that water to preserve it for future dry or drought years. So Dr. Dahlke and her researchers have been studying agricultural managed aquifer recharge, or Ag MAR as they sometimes call it. The agricultural landscape has potential to be used as large spreading grounds and working landscapes are often connected to water delivery systems that could be used to move flood waters onto fields for infiltration. However, there are several questions they are working to find answers for, questions about suitable locations, suitable soils, and which cropping systems can tolerate potentially more water in the winter of potentially even during the growing season. 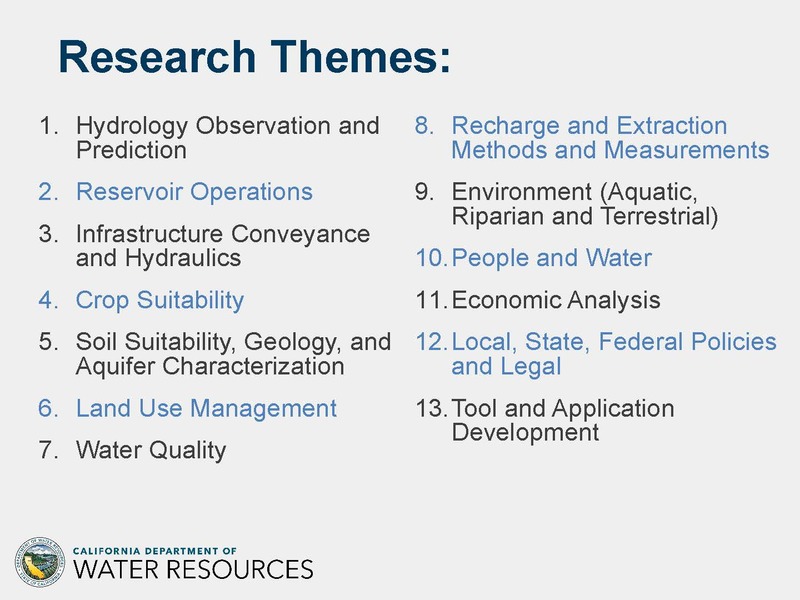 There are questions about hydrogeologies, feasibility, and water availability. There are concerns about how this practice could impact water quality, particularly on agricultural fields that receive nitrogen fertilizers or pesticides that could be leached to the groundwater. There are also questions around cost and incentives as well as the laws and the permitting to obtain water and surface water rights for flood flows. Dr. Dahlke’s lab has done several on-farm experiments in the last four or five years. They started with alfalfa, which is a very important forage crop for the dairy industry. Alfalfa is a nitrogen fixing plant so it doesn’t receive much nitrogen fertilizer; that makes it a good candidate from a water quality perspective because the risk of leaching nitrate to the groundwater is fairly low. 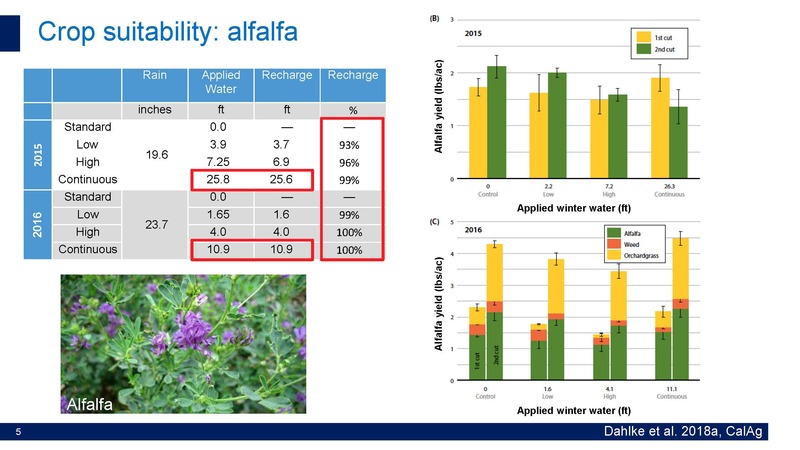 They have done several experiments with farmers to determine how much water can be applied on alfalfa during dormancy; Dr. Dahlke said one farmer in Northern California was able to apply up to 26 feet of water, which is eight to ten times of what the alfalfa needs in the growing season, and there was very little impact on the alfalfa yield. Those experiments are currently being repeated in the warmer climate of Southern California where the alfalfa is not going dormant. Since those experiments are underway, there aren’t any results at this time. 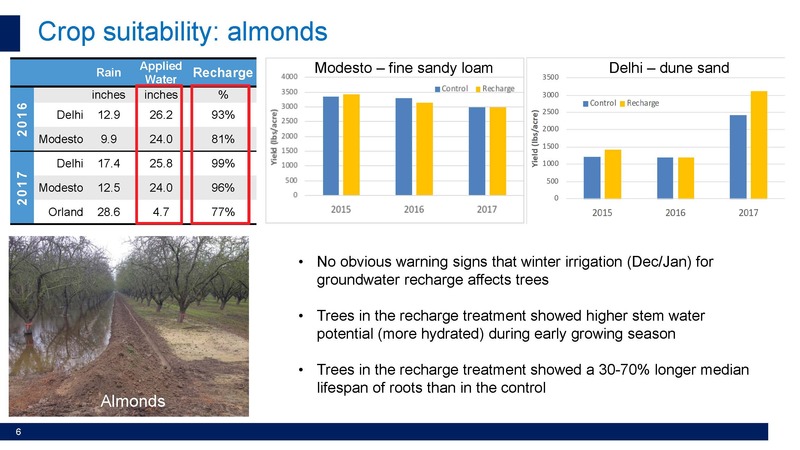 They also worked with the California Almond Board and private landowners, applying 2 additional feet of water in addition to precipitation on two different orchards. They saw a lot of water moving past the root zone towards the groundwater table. They also looked at yield and could not find that the winter application was harming the trees to the extent that the yield was impacted. They have also studied nitrate leaching; they have taken soil cores on all of the research plots and looked into the residual nitrate content in those cores. They have also looked into surface water availability, focusing on flood flows. “We were interested in estimating how much water is actually in those big flood peaks that we see sometimes occurring in the winter,” said Dr. Dahlke. 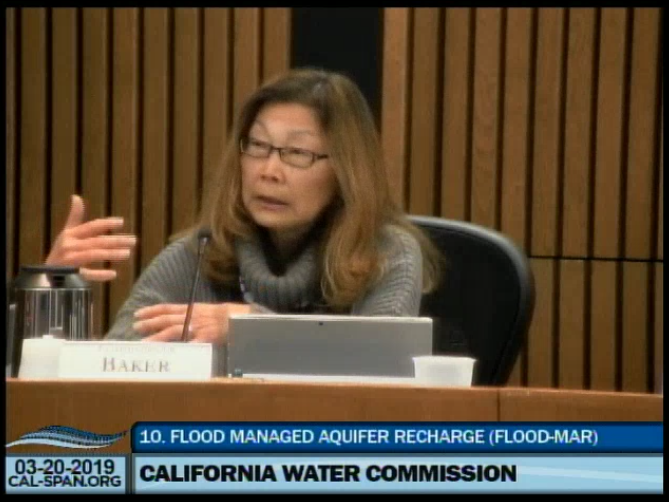 She noted that the flood flows have different frequencies of occurrence; in the Sacramento Valley, they occur in 7 out of 10 years; in the San Joaquin Valley, they occur about 4.5 out of 10 years. The Department of Water Resources C2VSIM. 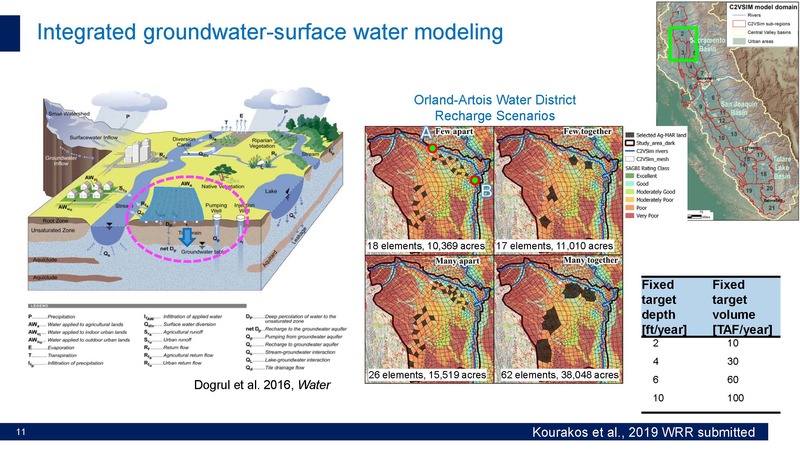 Model is an integrated groundwater surface water model which allows modeling any component of the hydrologic cycle. 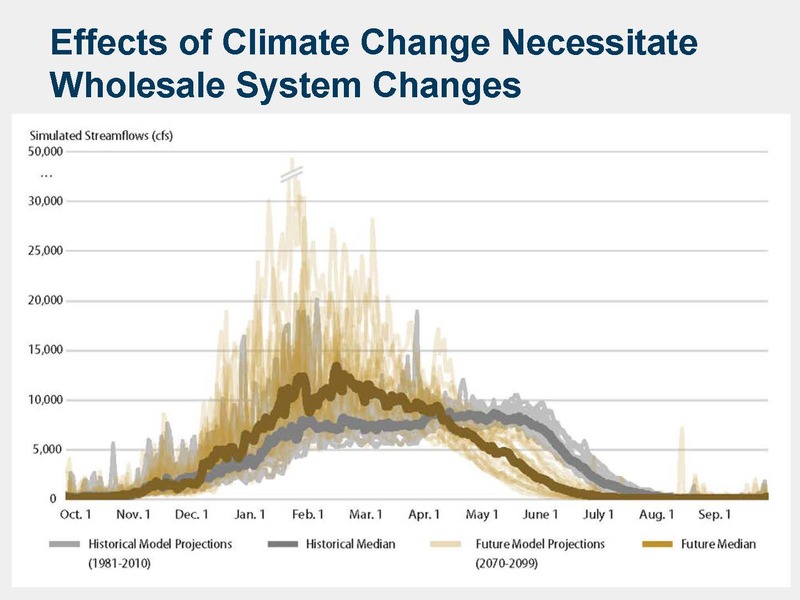 They used the model to answer questions such as would a different distribution of recharge lands make a difference for how much water is going to groundwater storage. They have also tested different recharge amounts ranging from 10,000 to 100,000 acre-feet per year. 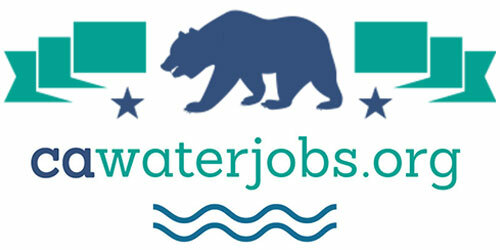 They focused analysis on a water district in the Sacramento Valley, the Orland Artois Water District. 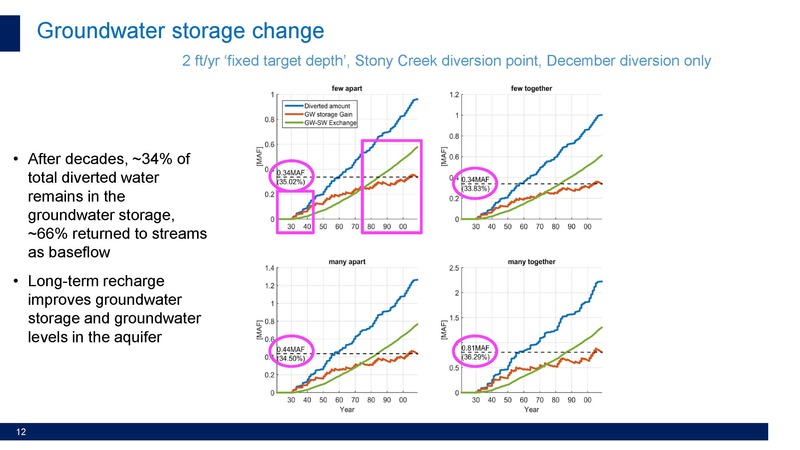 The four different land scenarios are shown in the center of the slide; the blue line shows the amount of water that was diverted from the river and applied as recharge; the red line is the amount of groundwater storage gain (or the amount of water from recharge that stays in the aquifer), and the green line is the amount of water going back to the river as return flow. The charts below show that the gain is happening in the first ten and twenty years; there are efficiencies of 60-70% and then it levels off over time, she said. They also looked at how recharge influences streamflow. 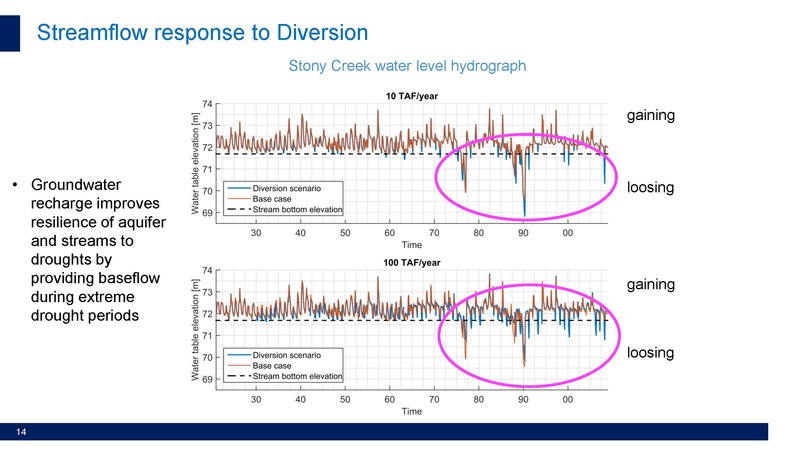 They determined that if they are diverting large amounts from a small tributary such as Stony Creek, a small tributary to the Sacramento River, there will be some streamflow impacts downstream of the diversion point where the water is diverted for recharge; however, as soon as the aquifers are better reconnected with the stream, there are benefits during drought periods when the aquifer is a little bit more resilient and is feeding more baseflow back to the stream, she said. 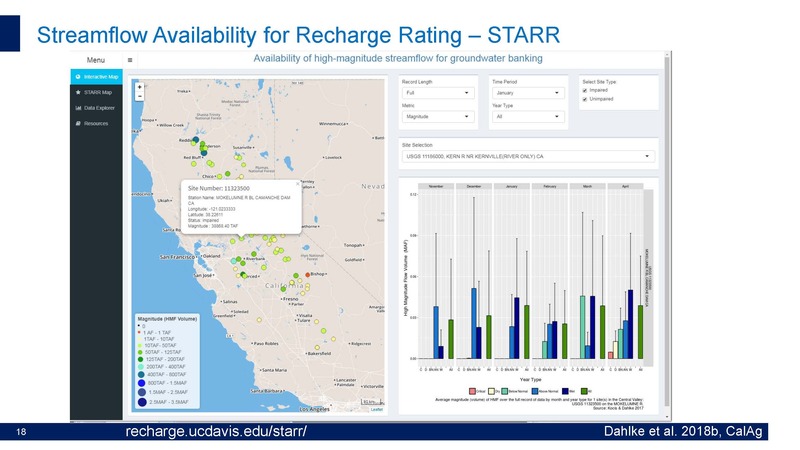 Lastly, Dr. Dahlke presented two of the decision support tools that have been developed at UC Davis. The Soil Agriculture Groundwater Banking Index (slides below) was developed by Toby O’Jeen, a soil specialist. The tool is available online and allows anyone to identify whether or not their land is suitable for groundwater recharge from a soils perspective. The tool uses soil survey data to rank the lands based on five factors highlighted in the red box. They estimate about 5.5 million acres in California have suitable soils for groundwater recharge and are highlighted in green on the map. 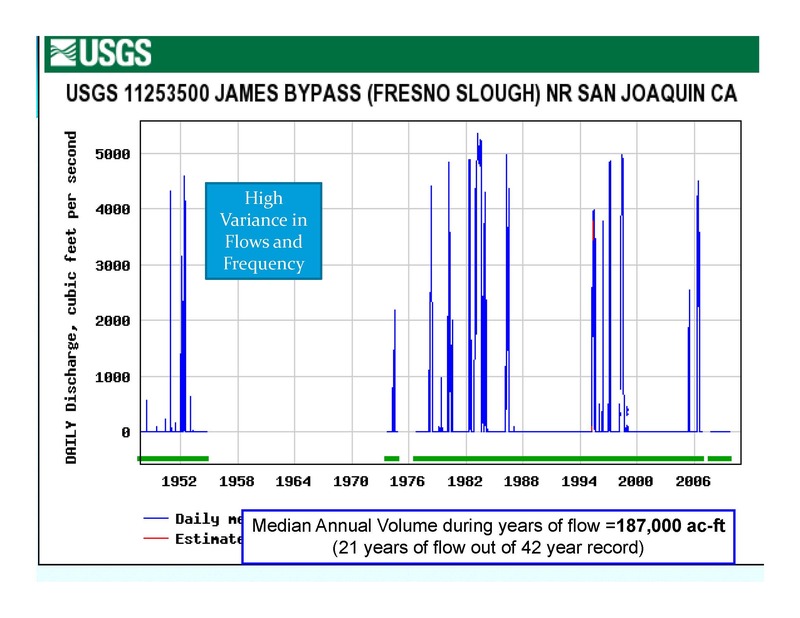 The Streamflow Availability for Recharge Rating tool (slides below) makes the statistical measures and data downloadable for the estimates of the availability of flood flows in the Central Valley. Visit Dr. Helen Dahlke’s webpage by clicking here. Access the Soil Agricultural Groundwater Banking Index by clicking here. 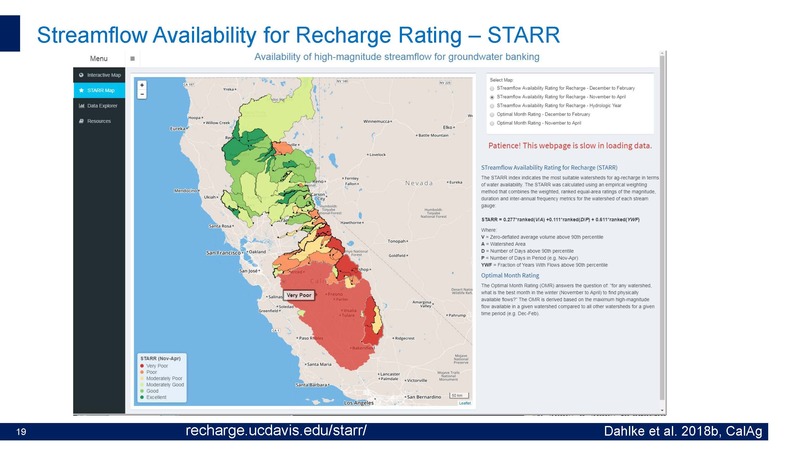 Access the Streamflow Availability for Recharge Rating tool by clicking here. Don Cameron is General Manager of Terranova Ranch and President of the State Board of Food and Agriculture. He spoke about his on-farm recharge efforts at Terranova Ranch. Terranova Ranch is located in the center of Fresno County, about 35 miles southwest of Fresno. 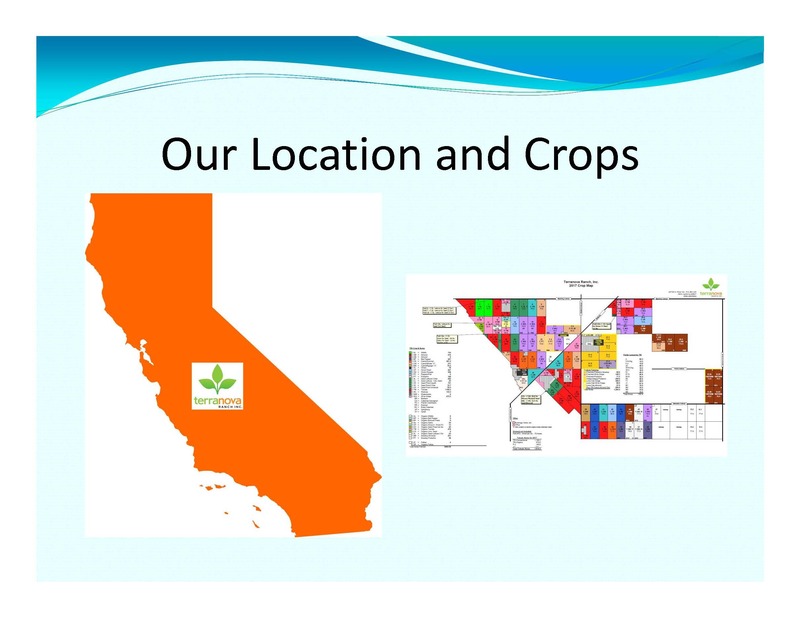 They farm about 9000 acres and 20 different crops, both organic and conventional. 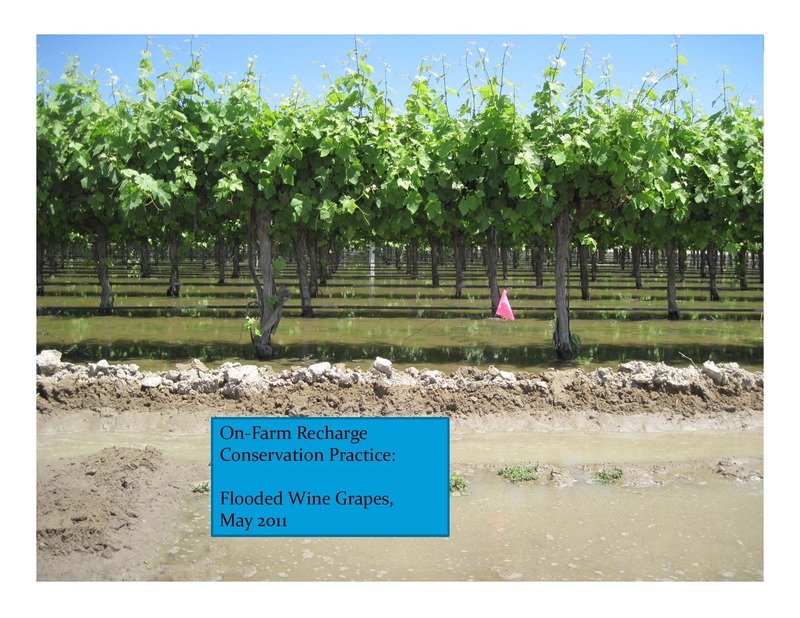 In 2009, they converted all of their row crops to subsurface irrigation; their trees and vines have been under drip irrigation since 1983. The Ranch is part of a GSA that consists of two water districts that have no conveyance and no water rights; the remainder is white (or undistricted) area. The area relies entirely on pumped groundwater. Mr. Cameron said that in the 38 years he has been farming in the region, they’ve seen a two foot decline in water table per year from groundwater pumping. In the past, people were reluctant to build infrastructure for a flow that is so variable; the infrastructure is expensive and floodwater didn’t have a lot of value to most people. Their groundwater subbasin is overdrafted around 125,000 acre-feet; their GSA is responsible for about 90,000 acre-feet of that overdraft, Mr. Cameron said. 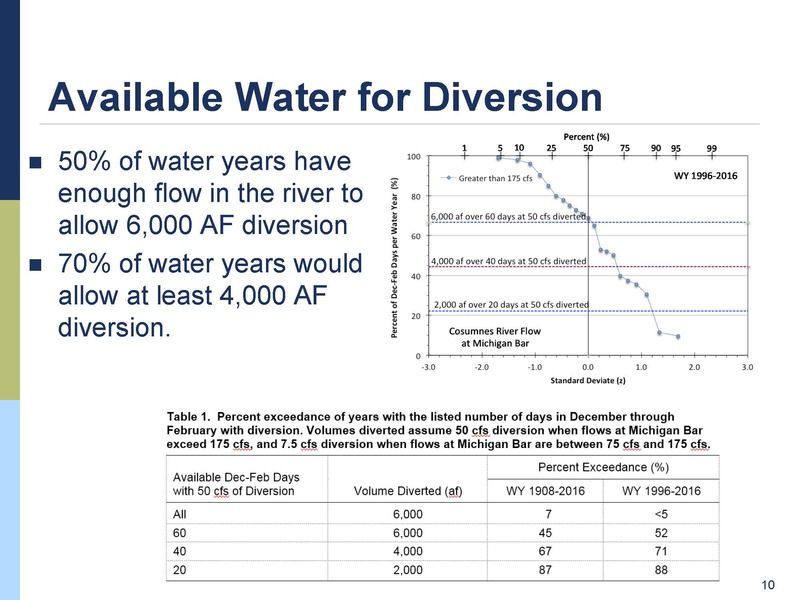 Their aquifer has a Corcoran clay base around 550 feet; the aquifer is currently around 240 feet; they think they can store 2.6 MAF in the space that’s within the aquifer. 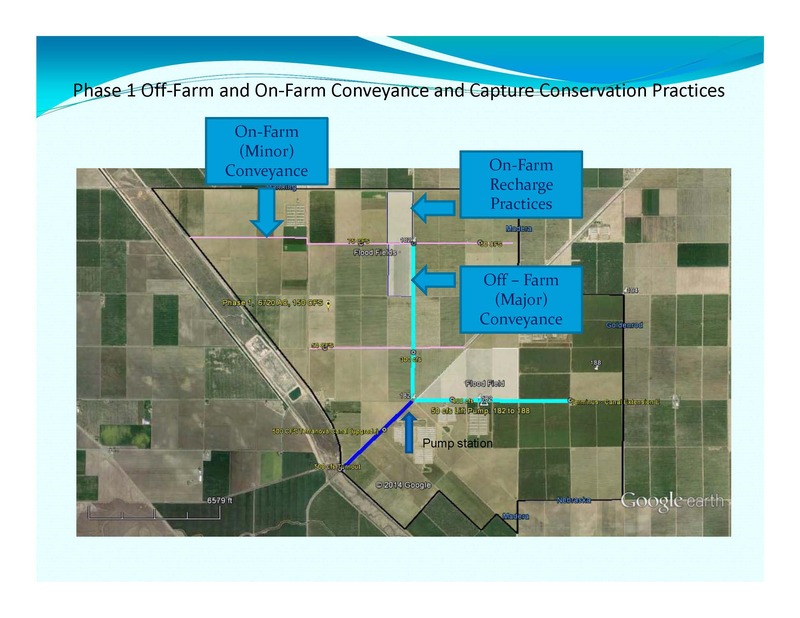 In 2010, Mr. Cameron received a $75,000 Conservation Innovation Grant from the NRCS that was matched with $75,000 from Terranova Ranch to implement the project to prove the concept that they could do on-farm aquifer recharge. 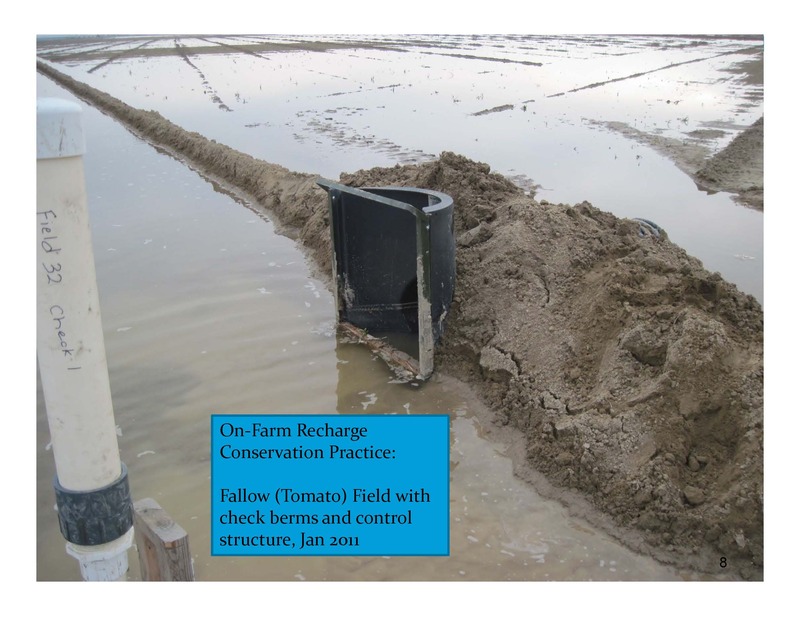 They were ready in February of 2011 and began by bringing the water on the farm through the existing system and flooded fields for two months. They then let it dry down and turned around and planted a crop of processing tomatoes in late March. 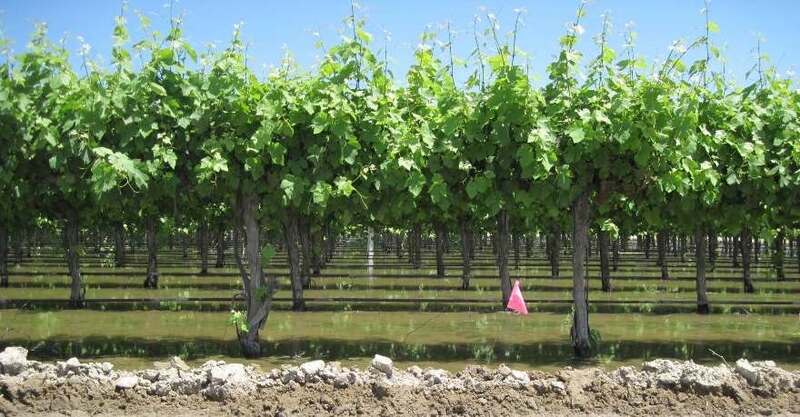 Mr. Cameron recalled how back in 1992-93, the San Joaquin River flooded, and there was a vineyard that flooded with only the top foot of the vines out of the water for six months, and that vineyard suffered no permanent damage, so he figured he’d give it a try. 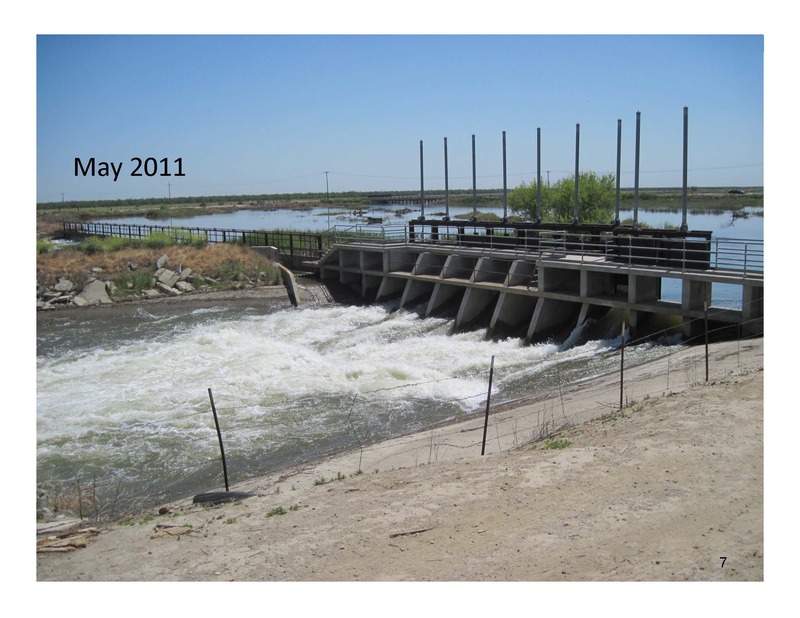 In 2012, they received a Floodwater Corridor grant from DWR to take water off the river so help reduce flooding downstream in the small communities that border the river. They turned it into a groundwater recharge project. It began as a $5 million grant from DWR with a $2 million match which would come from the sale of easements for flooding, so there are permanent flood easements on part of their property now, and the $2 million went back into the project, he said. The project has been broken into three phases with the first phase being 5500 acres in the center of their operations. 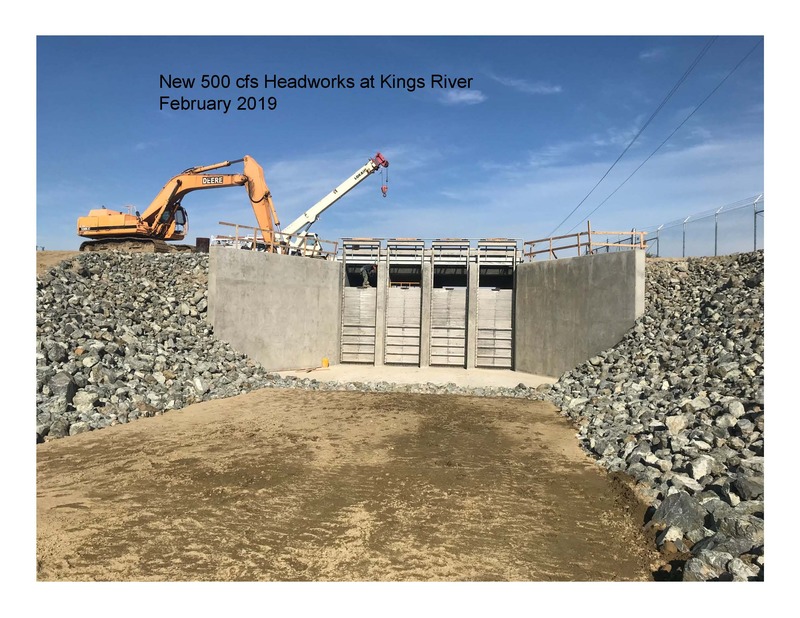 They have constructed new headgates, a pumping station, and a canal; they are going to extend to the east and the north and add ponding basins at the upper locations and on the east side. 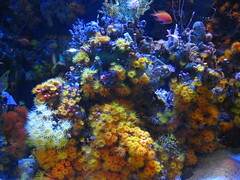 The system they started with in 2011 was pretty rudimentary; it could convey 17 cfs as best, he said. The new headgates have capacity for at least 500 cfs, so it has the capacity the convey 1000 cfs through the system. 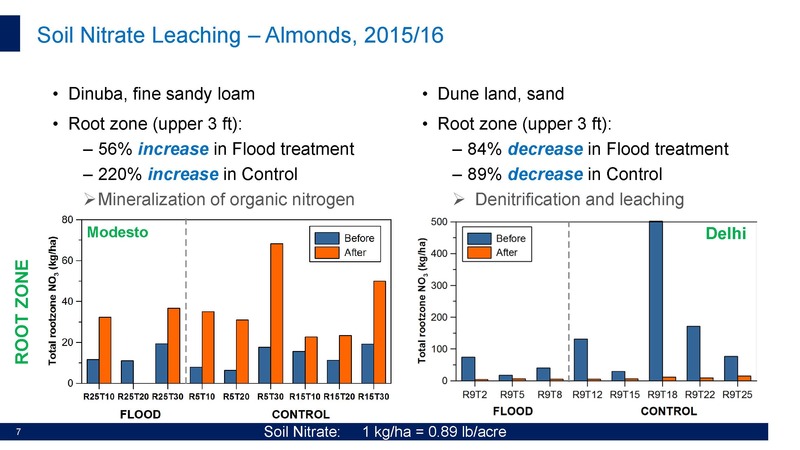 In 2017, they flooded their pistachios and almonds, as well as open fields prior to planting. They have monitoring wells in place with remote sensors so they are now monitoring water table elevations and are working on phase 2. By the time they finish phase 3, they will be recharging on 18,000 acres. Dr. Laura Foglia is an Assistant Adjunct Professor at Department of Land, Air, and Water Resources at UC Davis, and she discussed a pilot study that is underway on the Cosumnes River. 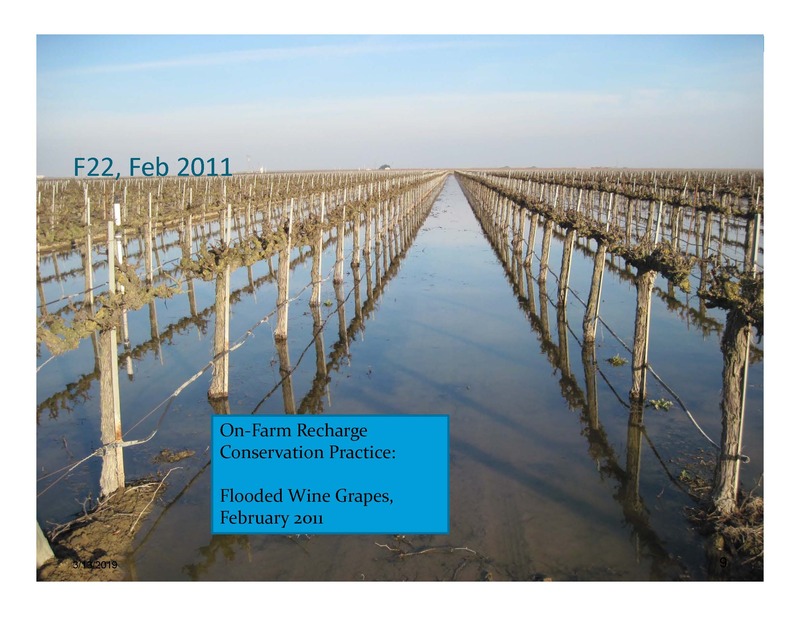 The project started as an Integrated Regional Water Management grant which had to be reconfigured because the original idea didn’t work; instead of building a reservoir, they are now doing more winter flooding on vineyards. 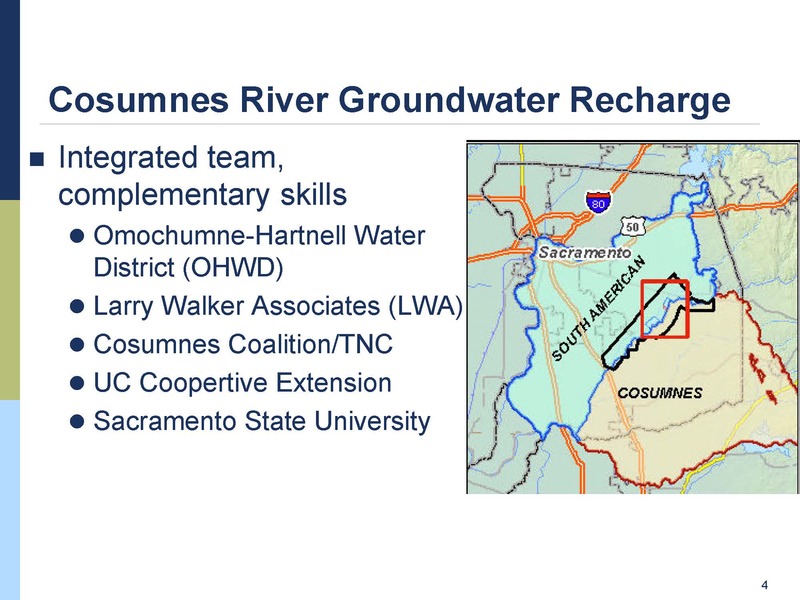 The water district they are working with, the Omochumne-Hartnell Water District, is split between two basins for SGMA; the northern portion is in the South American Subbasin, the southern part is on the Cosumnes Basin. 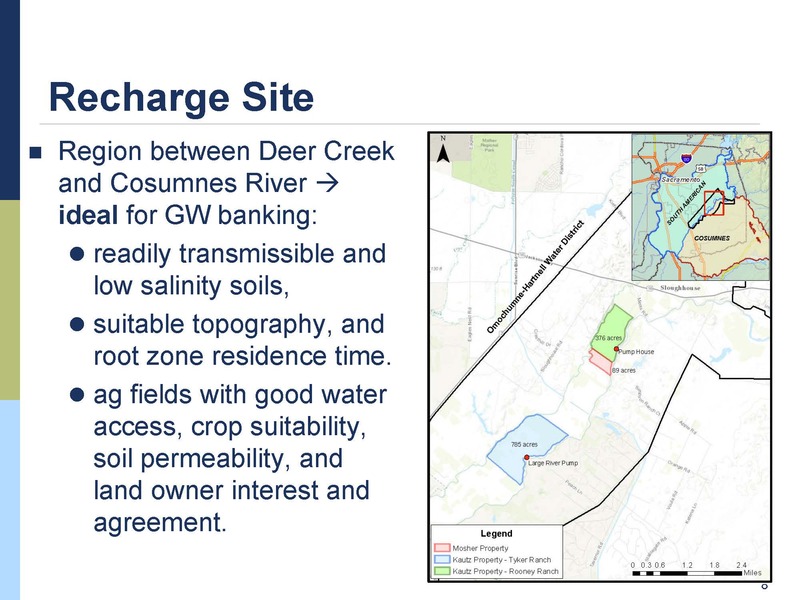 They are dealing with the development of two Groundwater Sustainability Plans, so this project could potentially have some benefits to both basins. 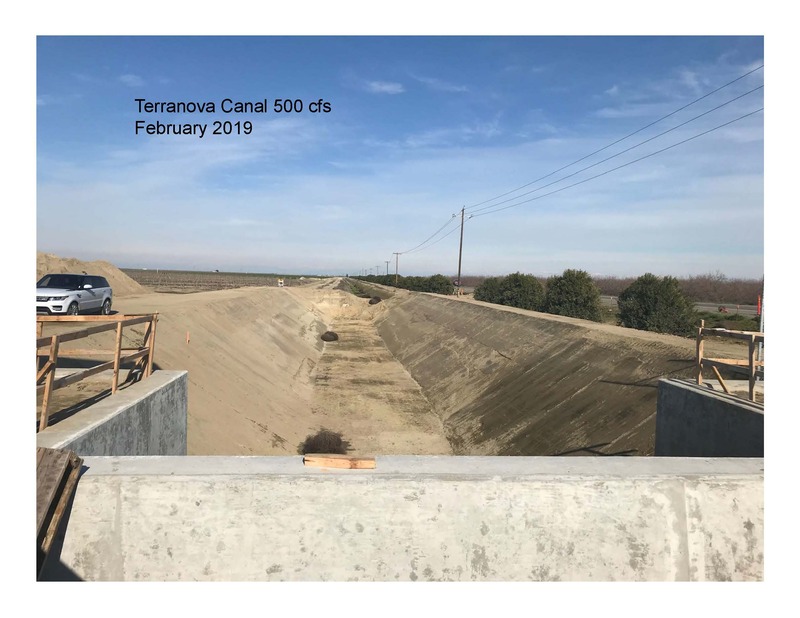 The project has many partners, including the Cosumnes Coaliton and The Nature Conservancy, the UC Cooperative Extension, Sacramento State and UC Davis. The project began in 2012, but due to permitting and funding issues, actual construction started just this month (March, 2019). There are a number of questions about the project. Where is the recharge going? Is it flowing towards Sacramento so only the city is getting the benefit? Is the recharge water staying in the District? Is it flowing under the Cosumnes River and flowing into the Cosumnes subbasin? The question is how much water is providing to the different basins because the farmers want to be recognized for what they are doing, she said. They are also looking at the potential impacts to crops. The study is designed to be as comprehensive as possible; construction is currently underway. They are doing continuous groundwater monitoring, ET and plant stress monitoring as well as an extensive modeling effort. There are already models available for the area, but the idea is that to really be able to understand the local conditions, the models need to refined for the specific area, she said. 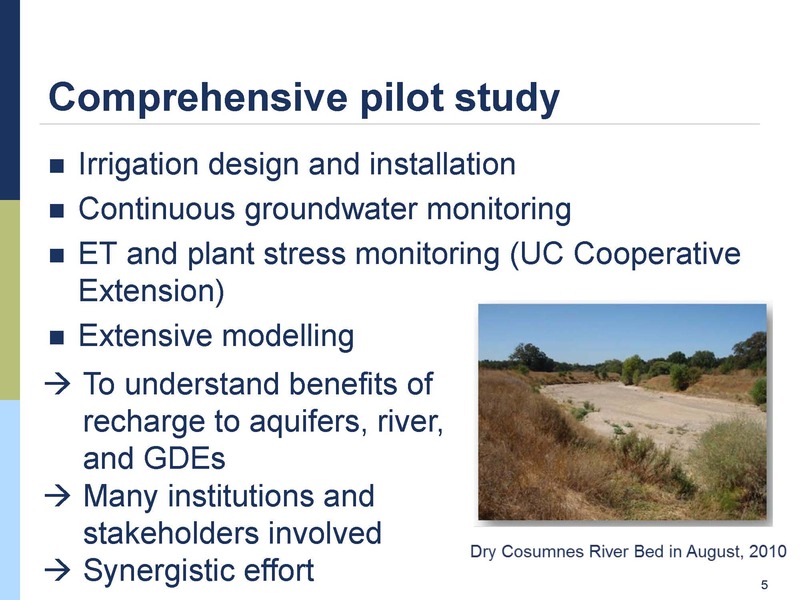 “We want to understand the benefits to the aquifers and to the river, and in the Cosumnes River, there are a lot of groundwater dependent ecosystems, so it’s important that we can show some kind of benefits for all the components of this system,” Dr. Foglia said. There are two vineyards totaling about 1000 acres that are being used as recharge sites and are shown in light blue and green on the map. They are working with the landowner to reach agreement on the property shown in orange. The fields are located between the Cosumnes River and Deer Creek; the Folsom South Canal is basically through in the middle between them. Farmers have done some infiltration testing and have demonstrated high numbers. The fields all have the facilities to pump water out of the Cosumnes River, so when the water is available, they flood their fields over the wintertime. Their permit allows them to divert water only between December and February. The project is designed to work for the next ten years so they can develop a long-term picture of what is happening with the crops and the groundwater. They will begin with diverting at 4000 acre-feet per year, but the system is designed to divert up to 6000 acre-feet. They are doing a lot of groundwater monitoring to measure the baseline conditions so they will be able to demonstrate what’s happening before and after. They have installed the four new groundwater monitoring wells in the area of the recharge site, and with the existing monitoring wells they will have ten locations with continuous groundwater level and temperature measurement. They are also including some electrical conductivity in some of the sites with the idea to use the electrical conductivity as a tracer. The plan is to make all of the data available to the farmers, and eventually available to the public online. 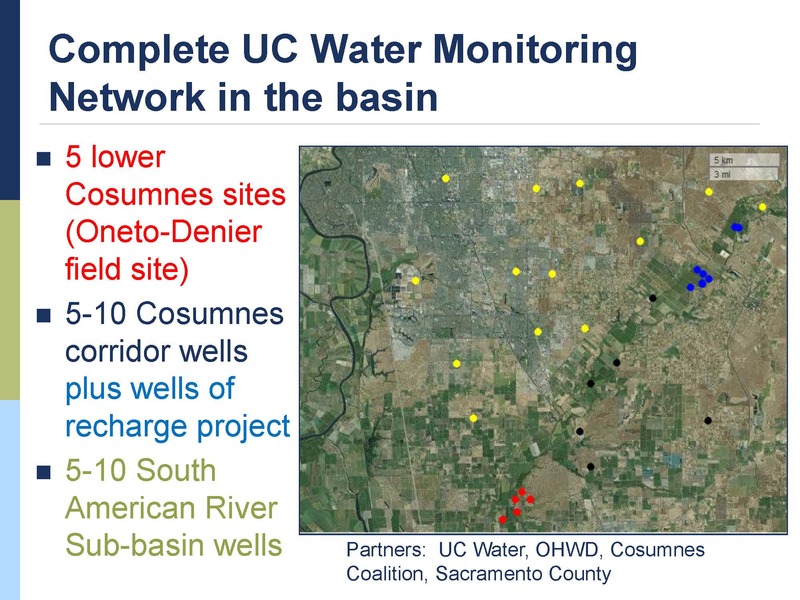 There is also a larger UC Water monitoring network in the basin. The blue dots are the wells onsite where they are doing recharge; the red dots are wells in the Lower Cosumnes, and the yellow dots are wells that are being considered. Once completed, it will give a full picture of what’s happening, she said. They also have support from UC Santa Cruz as well as Lawrence Livermore Labs and Sacramento State, who have helped with installation of monitoring systems. Click here to visit Dr. Laura Foglia’s webpage. Commissioner Del Bosque asks Dr. Dahlke about suitable soils. What’s suitable, what’s not suitable? Commissioner Del Bosque asks about the depth of the existing water level. In some places it is 10 feet, in others it’s maybe 500 feet. Does that make a difference? Commissioner Del Bosque asks Don Cameron if he was storing water above the Corcoran clay. “To the west of us as you get into Westlands, the water above the Corcoran clay is pretty poor,” acknowledged Mr. Cameron. 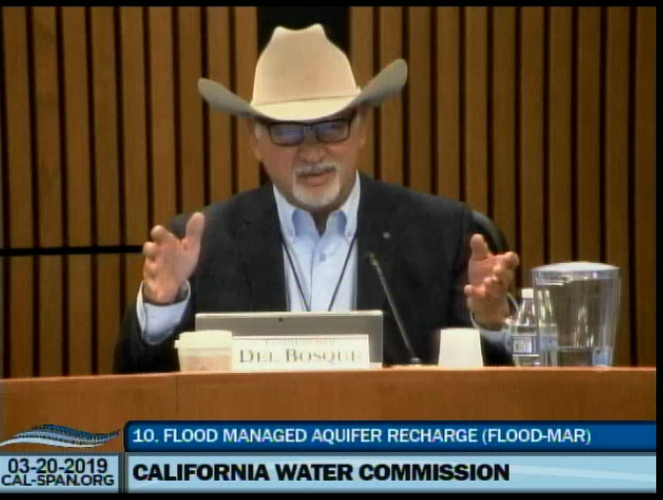 “Would some of those areas like that be good candidates for this sort of program, in places where perched water tables a poor water quality?” asks Commissioner Del Bosque. 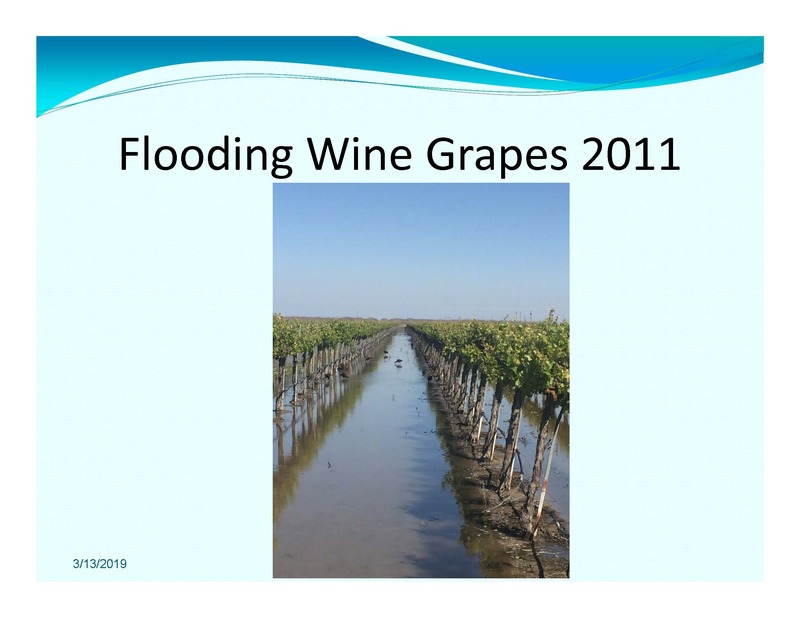 Commissioner Del Bosque asked about flooding the grapes. Was that constant or did you find that it’s better to do it intermittently? 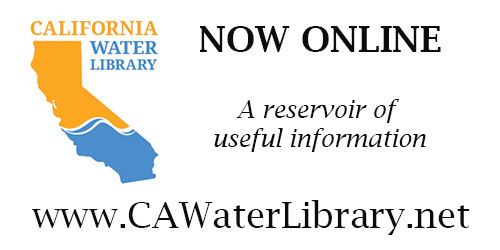 For the agenda, meeting materials, and webcast for the March meeting of the California Water Commission, click here.